Punta Cana is known for its wide white sandy beaches. The water is shallow for a long time and it is safe to swim here year round. Unfortunately for those not staying at exclusive resorts many stretches of these beaches are fenced off and guarded so only resort guest can enjoy those beaches. Some hotels still sell day entrances which also entitles you to get free food and drinks. The entrance therefore is not cheap and cost up to US$ 70. 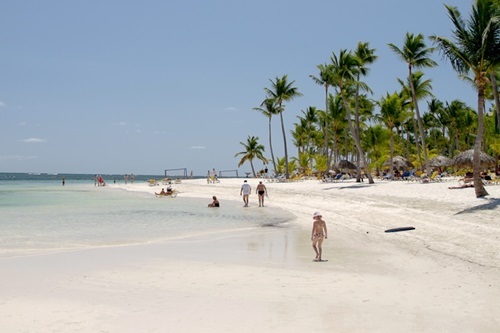 The beach at Punta Cana stretches over 30 miles (about 50 kilometers) all the way from PUNTACANA resort to Bavaro and is lined with coconut trees. There are so many kilometres of the beaches that even at the height of the season they never are overcrowded. All the coast here is also know as La Costa del Coco (Coconut Coast). Every few kilometers there is an all-inclusive resort. Hower there are no towns or villages that you would come across. The only exception is maybe the village El Cortecito, where they try to sell overpriced items to tourists. Note: Leave your valuables at the hotel when walking the beach, and caution should be taken in deserted beach stretches.